MORTDECAI may well be not only the worst film Johnny Depp has ever starred in, but also the most painful performance of his career as well. A farce set in the art world’s underbelly in an ambiguous decade, we follow Charlie Mortdecai (Johnny Depp), an art dealer in serious tax debt who reluctantly accepts a mission from MI5. That mission is to track a stolen painting containing a secret that is sought after by some rather unsavoury individuals, all in exchange for Her Majesty’s reprieve. The story? Well, apart from the quite frankly desperately cobbled together synopsis above, there really isn’t one. Instead we are given a series of seemingly unrelated sketches, each boasting gags less funny than the last. Farces are meant to be entertaining confusing, not annoyingly incomprehensible. Characters in these kinds of stories are meant to be endearingly lost, not bilious morons without merit. Detestable from the very start, Charlie Mordecai opens the film with an odious ode to his new facial hair. I know it’s an intentionally exaggerated performance, but Depp chose that wormy smile, that slurring upper class sub-FAST SHOW diction, and it all starts to grate even before the movie’s two-minute mark. Mortdecai is impossible to like – though good characters almost never have to be likeable – but he’s completely one-note as well. The character’s inconsistency gets to me as well. Is it possible to bumble and stumble through life to such an extent and have an encyclopaedic knowledge of art and social history? If that’s a comment on the English upper classes, then it’s not a very good one. Either David Koepp is picking and choosing when to make Mortdecai an idiot or he doesn’t realise how bad his screenplay is. Funny voices and silly behaviour alone do not make for a good comedy film. There have to be actual jokes, or at the bare minimum, wit. Inspector Clouseau was always an idiot, but he was a lucky idiot and he saved the day through sheer fluke. 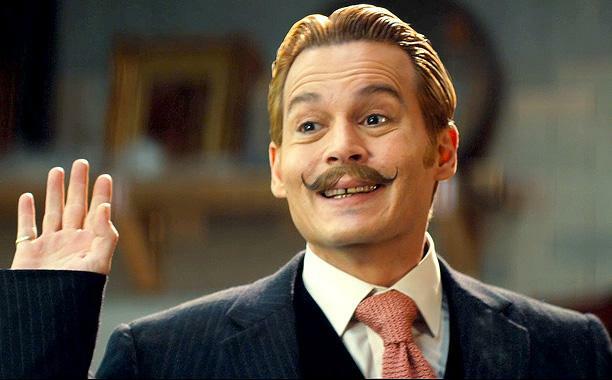 Mortdecai is a selective idiot that exposes glaring weakness in the film’s screenplay. Gwyneth Paltrow is wasted as Mortdecai’s wife Johanna, which is a real shame as as the brains of the relationship she could have been a really interesting character. Paul Bettany, on the other hand, appears to be part of another much better comedy film as Mortdecai’s hired muscle/valet Jock. Bettany is so endearingly dedicated to his master, is such an earnest hard-man throughout that you almost forgive him for not saying no to the uttering dialogue comparing women to cars. Ewan McGregor is fine as an MI5 agent. Depp must have been thrilled to get his (somewhat baffling) acting hero Paul Whitehouse to cameo as what appears to be a reprisal one of his sketch show characters. There’s some really ugly scene transitions that look like the map scenes from INDIANA JONES mocked up in a Computer Aided Design programme from the late 90s. Making these an essential part of the globetrotting was a mistake. The film’s editing in general is a little haphazard in all honesty. Mortdecai saying that the moustache he has recently committed to will “eventually come to fruition”, the “Oo golly I’ve read about this!” response to being drugged in a toilet, and a moment of pure slapstick while out on a hunt, all raised a slight smile. Acting surprised at the extent of his debt by quipping “I didn’t realise I was so deep in Her Majesty’s hole”, didn’t. Using vomit in an action sequence without going over-the-top requires a lightness of touch. Koepp doesn’t manage it in Mortdecai, and you just think “Did you really have to?”. The same goes for well over half of the crude gags in the film – I’m not saying you can’t have toilet humour, but these jokes have to be funny enough to justify their being there. At the film’s 20-minute mark, where we’ve just had two successive gagging at the moustache gags (there was more to come on that score), I was seriously conducting hurling the laptop I was watching the film on at a sturdy wall. There’s just so little on offer to make the pain the viewer is being put through worth it. This entry was posted in Film, Film Review and tagged Comedy, David Koepp, Ewan McGregor, Farce, Fast Show, Film, Gwyneth Paltrow, Indiana Jones, Johnny Depp, Mortdecai, Movies, Paul Bettany, Paul Whitehouse. Bookmark the permalink. Sounds genuinely awful. Good review, though. Please heed this warning: do NOT subject yourself to it!